Protected messages allows the sender to set specific permissions on a message, such as Do Not Forward or Do Not Print. 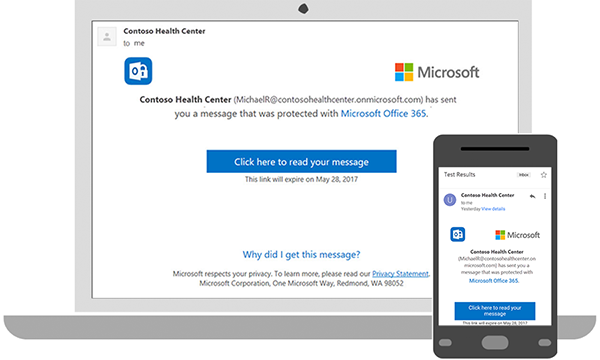 If you receive a protected email message sent to your Office 365 account in Outlook 2016 or Outlook on the web, the message should open like any other message. You'll see a banner at the top of the message that informs you of any restrictions on the message. If you're using a different email account or email program, you may receive a notification that you've received a protected message and need to take additional action. Select Click here to read your message. You'll be redirected to the Gmail sign-in page. Once you sign in, select Allow. Your protected message will display in a new browser tab. You won't be able to view the protected message in the Gmail window. Tap Click here to read your message. Tap Sign in with... and sign in to your email account. If you get a request for permissions, tap Yes or Allow to view the message. You'll be redirected to a page where you can sign in and receive a single-use code. Check your email for the single-use code. Enter the code in the browser window, then select Continue to read your message. Tap Click here to read your message > Sign in with a single-use code. Check your email for the single-use code and copy it. Enter the code in your browser, then select Continue to read your message.